One of the most important American artists to emerge in the 1990s, Jim Hodges is known for his ability to transform mundane, found, or simple materials into moments of sheer beauty. Hodges’ vast material vocabulary includes silk flowers, light bulbs, metal chain, mirrors, gold leaf, and make-up, and he often uses them to conjure concepts of time, memory, love, and loss. 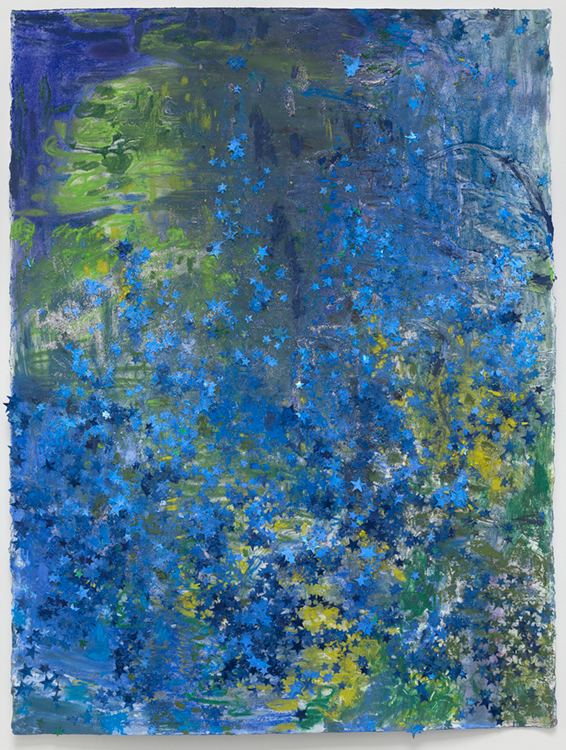 In this work from 2017, Hodges uses the color palette and composition of a Monet waterlily painting, combining it with glitter sprinkles and stars. As dusty crumbles of pastel mix with the glimmering craft material, one senses Hodges’ delight in the light, color, and space of the natural world that is found in sources both mundane and sublime. Hodges’ work has been the subject of numerous solo exhibitions at institutions such as the Centre Georges Pompidou, Paris; Camden Art Centre, London; the Aspen Art Museum; CGAC, Santiago de Compostela; Tang Teaching Museum and Art Gallery at Skidmore College, Saratoga Springs; and the MCA, Chicago. Most recently a major traveling retrospective of Hodges’ work was exhibited at the ICA, Boston; Walker Art Center, Minneapolis; the Dallas Museum of Art; and the Hammer Museum, Los Angeles. Hodges’ work is in the permanent collections of major museums around the world. In 2008, Jim Hodges was the TWO x TWO for AIDS and Art honoree.